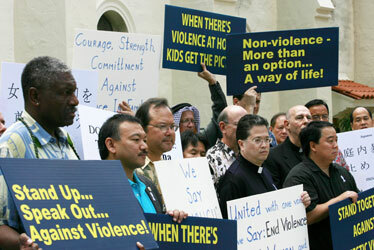 Dozens of men attended a rally yesterday at Our Lady of Peace Cathedral committing to work against domestic violence. The event was sponsored by Catholic Charities Hawaii. Dozens of men rallied yesterday against Hawaii's tide of domestic violence, which has already claimed the lives of eight women in the past 12 months. For confidential assistance with domestic violence, call the Domestic Violence Action Center's help line at 531-3771. "I pledge to seek equality and respect in all my relationships with women. I commit to lead by example and be a role model to other men and a mentor to our young generation in ways that create a future free of violence for women and children." The rally included more than 20 community leaders, including legislators, clergy and prosecutors, at Our Lady of Peace Cathedral downtown. "In the last 12 months, nine people have died (in domestic violence); eight were women," said Joe Bloom, of Catholic Charities Hawaii. "Women have been doing the work for too long; now it's time for men to say, 'I don't believe in violence either,'" said rally participant the Rev. Al Miles, of Pacific Health Ministries. "We need everyone to join together." Miles has seen many incidents of domestic violence through his work as a chaplain at the Queen's Medical Center. Miles recounted how a female victim with numerous broken bones told the doctor she had "fallen down the stairs" but revealed to Miles her husband had hurled her down the stairs. The most important issue is changing the prevailing societal attitudes, which Miles said permit domestic violence. We need to come to the point as a community where we do not tolerate violence and communicate this to all abusers, he explained. "These men really do this because they can. It's not about what women do or don't do. No one deserves to be abused," Miles said. Nanci Kriedman, chief executive officer of the Domestic Violence Action Center, was encouraged by the support from men. "This has always been seen as a women's issue, but it's really a community issue. The community consists of men and women," she said. "The thing about the killings, if I'm a battered women and I see people getting killed, I either get inspired (to leave) or immobilized (by fear)," she said. "We want to encourage the victims to call for assistance," Kriedman added.